The Web and mobile app stores are saturated with solutions that make buying plane tickets or booking sports facilities easy and convenient. When it comes to something as time sensitive and painful as a toothache, good solutions are scarce. Stranded with a toothache in a region without a dentist, Nikolai Bratkovski spent over two hours calling friends and searching online to book a dentist appointment. Bratkovski was lucky to get an appointment for the next day. “Why can we book a restaurant or a vacation online but not a doctor?” Bratkovski said. To solve this problem, Bratkovski, a serial entrepreneur with a track record in the healthcare industry, founded HealthAware with Alex Chyrstik in 2010. In 2012, HealthAware was in the spring cohort at FounderFuel, a 12-week startup accelerator in Montreal. HealthAware is a Web-based free service that makes it easy to find health practitioners, see their availability in real-time, and book appointments 24 hours a day, seven days a week. Profiles of health practitioners feature information about them, ratings and reviews by patients, and a calendar with available appointments. 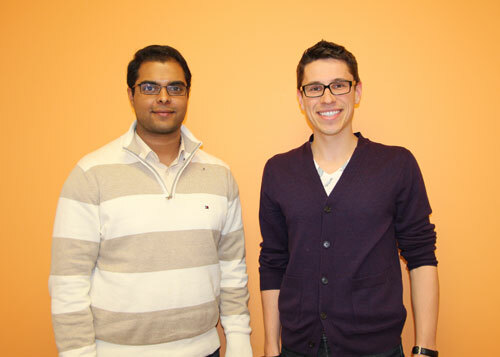 Nikolai Bratkovski, CEO & Founder, and Karthik Rao, Product & Engagement, at the HealthAware downtown Toronto office. Photo by Maria Karpenko. HealthAware is building a community of health practitioners and patients. “Right now, it’s difficult to navigate the healthcare system. We’re making it super easy for people to access health services around them. We give health practitioners the tools to deliver top-notch service to their patients. We want to use this link to provide more services in the future,” Bratkovski said. Since last summer, HealthAware has grown from 300 to over 1,500 health practitioners. Every month, 500 health practitioners join HealthAware and 160,000 people in Ontario use HealthAware to find health practitioners. The most popular specialties are Toronto Dentists, Toronto Physiotherapists, Toronto Optometrists, and More. The number of appointments booked on HealthAware is growing thanks to partnerships, media coverage, Google searches, and word of mouth. “We’re overwhelmed with the number of requests we’re getting from health practitioners to set up profiles,” said Karthik Rao, the first employee in the Toronto office. HealthAware gives patients the freedom to search for a clinic or health practitioner based on parameters such as location, field of speciality, and name. “We’re committed to giving patients the choice to book appointments that match their lifestyles. It’s absolutely wonderful when patients say they’ve use HealthAware once and they will use it every time,” Rao said. HealthAware monitors every appointment to ensure that any issues, technical or not, are resolved quickly. For example, if a clinic fails to respond to an appointment, HealthAware gets in touch with the patient to assist them and offers a digital gift card to Starbucks. Healthcare practitioners are often conservative and adopt new technologies slowly. Many offices still work with paper-based systems. To bypass this, HealthAware focuses on integration with management software packages that clinics already use. Integration is currently available for Antibex Universal, PMP, Cleardent, ABELDent, Practice Perfect, Google Calendar, and many more. Upcoming integrations include Clinic Master, ClinicServer, Tracker, and EyeFile. The main competitor of HealthAware is New York City-based ZocDoc. But, HealthAware positions itself as a technology platform that’s free as a basic service and connects to the scheduling systems clinics use. In the future, HealthAware will have a freemium revenue model that will offer various premium tools for health practitioners. HealthAware is currently only available in Ontario. It’s scheduled to launch in British Columbia at the end of this month and other provinces later this year. Launches in the United States are also scheduled for this year. The goal is to go global. “By the end of this year, we want to be the largest player in North America,” Bratkovski said. To achieve this goal, HealthAware will have to grow its health practitioner base to 15,000. To learn more about HealthAwere, visit www.healthaware.ca.